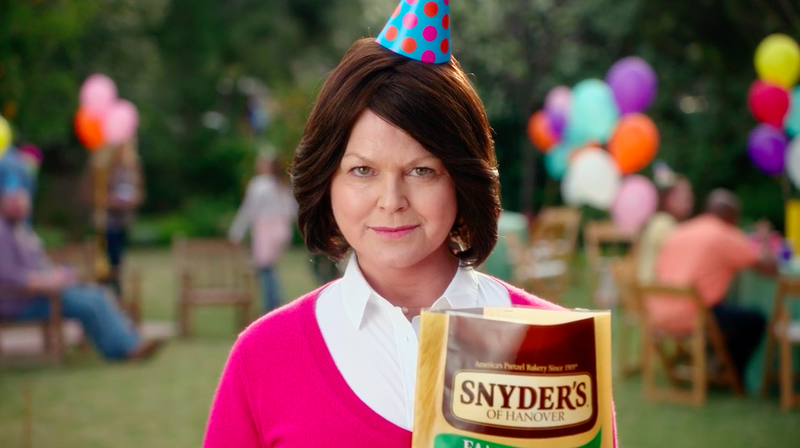 Barton F. Graf's signature absurdist humor arrives fully baked in its first campaign for Snyder's of Hanover pretzels. Broadcast spots and brief social videos introduce the line "Pretzels, Baby," delivered in mock-serious, smoky tones by actress Laura Wernette. "People have been eating pretzels since 610 A.D. So, at this point, it's safe to say people like pretzels," Barton F. Graf executive creative director Ian Reichenthal tells AdFreak. "A lot of flashy new snacks have come and gone in that time. And people may sometimes reach for them instead of pretzels. But if you're pretzels, you've got nothing to worry about. Pretzels aren't going anywhere. That's where the confidence of 'Pretzels, Baby' comes from." "We cast hundreds and hundreds of people" searching for the perfect spokesperson, says Reichenthal. The team ultimately chose Wernette because she embodied "a mom with the swagger of Telly Savalas." Actually, Kojak fancied lollipops, not pretzels. But that was 40 years ago, so who cares? Director Harold Einstein of Dummy keeps the setups simple, providing a punchy pace that lets Wernette's salty talk—by which we mean her G-rated pitch for pretzels—scale the heights of sublime silliness. According to Reichenthal, Wernette worked hard to stay in character between takes, practicing her lines "while sitting in a Chesterfield chair and holding an empty scotch glass."